Happy Kitchen Sink Stamps Monday, I hope you had a great weekend! It was mighty warm here again this weekend, so I thought maybe if I posted a Fall themed card, things might cool down a bit! Kitchen Sink Stamps has a lot of wonderful Fall themed stamps - today I reached for one of my favorites Multi Step Big Leaves. Sorry, no video again this week, I'm hoping to be back next week with more Kitchen Sink Stamps Video Tutorials. I used the Triple Dimension Technique from an older TJNL, to create the collage of leaves, aren't they lovely! 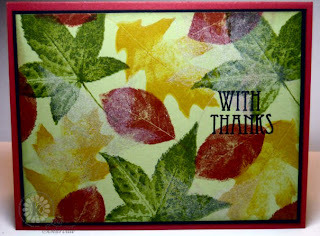 Not wanting to cover the leaves, I stamped the sentiment from Multi Step Harvest in Black, using a Stamp-a-ma-jig. Don't forget, Kitchen Sink Stamps, is hitting the road and heading to Houston for some Multi Step Stamping fun on October 8th and 9th. Click here for more information- space will be limited, so you'll want to act fast to reserve your spot! I love this gorgeous blanket of autumn leaves, Lisa!! Such vibrant colors!! I'm so excited that our paths will cross again in Houston!! I love those colors and those leaves look so real, great job. Beautiful fall colors. Love the layering of the leaves and the warm tones. This is so beautiful! It would be wonderful to use for Thanksgiving time! i love the colors! They are perfect! Beautiful Lisa! Love the rich colors used! Oh your leaves are just stunning, Lisa! LOVE the rich colors!! I am gonna have to check out this technique! Gorgeous. Love your use of the leaves. Love the colors. Wow! What a stunning beauty! I love the leaves with those warm and rich colors. Another beautiful creation.